The situation was overflowing with potential. It just needed the right person to tap it. And so far, Bryce Tesdahl appears to be that person. Tesdahl was hired two years ago to take the helm at East Ridge, a program brimming with talent. From the line of coaches with ties to the legendary Bob McDonald of Chisholm, who is his grandfather, Tesdahl has basketball in his blood. At East Ridge, Tesdahl saw a program with something special bubbling. The talented Raptors have that chance. They will be making their first state tournament appearance Wednesday when they play Eastview in the Class 4A boys’ basketball state tournament quarterfinals Wednesday at Target Center. East Ridge defeated Eastview 74-67 earlier in the season. “I thought year two, we’d take a big step and we did,” Tesdahl said. Despite his age of 27, or possibly because of it, Tesdahl dove headlong into the world of East Ridge basketball. Summer workouts became an obligation, as did lifting weights. Players began watching film. Scouting reports were developed regularly. Ben Carlson, a broad-shouldered 6-9 junior forward with nearly 20 Division I offers, said seeing the commitment of his coach rubs off on the players. Watch him conduct practice and Tesdahl’s passion for the game becomes obvious. Being so close in age to his players, he has a knack for communicating at a level to which they can relate. At a recent practice, Tesdahl conducted an interview with a member of the media, talking in coachspeak, using terms like culture and growth, opportunity and process. He then called his team together to begin practice and his voice took more urgency. He set stages, laid out goals, challenged and cajoled and motivated his charges. It’s all part of Tesdahl’s method. What better way to get full commitment from a group of players than to show it to them? High-level core players such as Carlson, Brown and his younger brother Kendall, all avaerage between 15.7 and 17.3 points per game. Couple their leadership with the contributions of point guard Zach Zebrowski, quarterback on the East Ridge football team, and sharpshooter Patrick Lynott, and the Raptors are far from your typical first-time tournament entrant. They’ve lost just twice, to Prior Lake and Eden Prairie early in the season, and have won 24 consecutitive games. With this year’s tournament field having no clear favorite, the Raptors walking away with the state championship trophy is a real possibility. Tesdahl believes as much and told his team so as he concluded his fiery pre-practice speech. Each of the five seeded teams feature at least one Division 1 level player. Junior Dain Dainja, a 6-9 force in the low post, leads Park Center. Hopkins has Star Tribune Metro Player of the Year Zeke Nnaji, who’s committed to Arizona, as well as 6-5 junior swingman Kerwin Walton. There’s the big three at East Ridge — senior Courtney Brown and his sophomore brother, Kendall, and junior Ben Carlson. 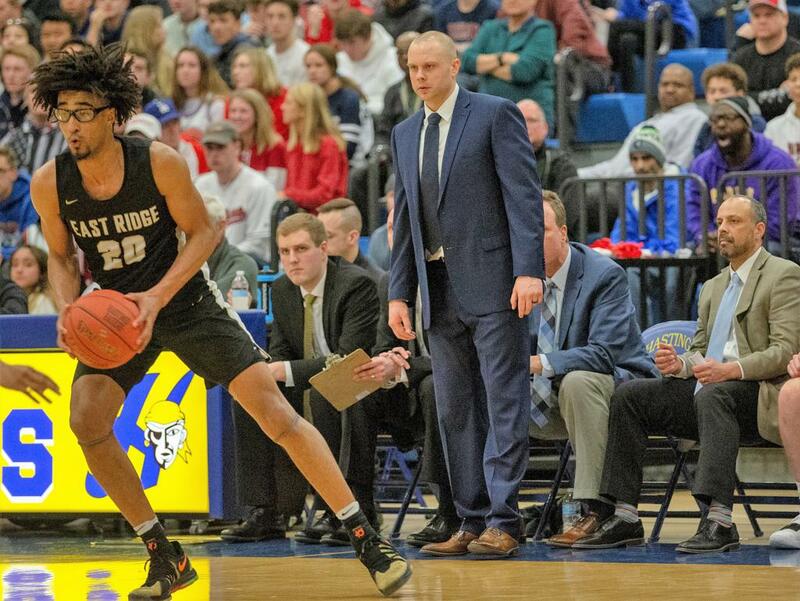 Eden Prairie’s gritty leader, Drake Dobbs, has verbally committed to Liberty University, and Lakeville North’s stellar 6-7 guard Tyler Wahl is yet another Minnesotan who will play at Wisconsin. Park Center was seeded No. 1 because the Pirates are the only one-loss team in the field. That is a testament to the mental toughness that coach James Ware has instilled. When the game is in doubt, Park Center finds a path to victory. The Pirates won seven games by five points or less, including a 57-55 triple-overtime victory over Champlin Park in the Section 5 championship game. First-time state entrant East Ridge started the season 3-2, losing to Prior Lake and Eden Prairie. Since then the Raptors have won 24 in a row. ... Maple Grove is playing its best basketball, having won 14 of its last 16, losing only to Park Center and Champlin Park. The Crimson are making their fourth consecutive tournament appearance.